There is a new challenge up today at My Craft Spot to use ribbon on your project. I just love the beautiful colors of the hand dyed crinkle ribbon that Kimberly has at My Craft Spot. 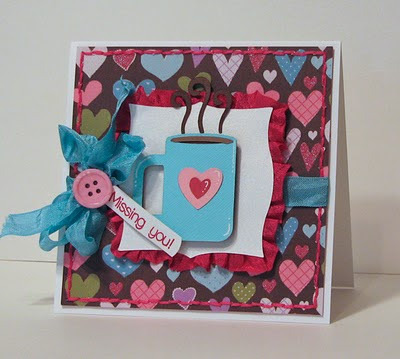 I used two of them (hot pink and caribbean) on my card below as well as the Sweet Sentiments - Set #2 for the sentiment. I used my Cricut to cut the die cut images.....the mug is cut from the Every Day Pop-up cartridge and the label is cut from Elegant Edges. Beautifully put together....and yes, that ribbon is fantastic! Definitely on my wish list! Beautiful card, Amy!! I love how you used the ribbon and your hot cocoa cup is so cute! Gorgeous card and love the colours of ribbon you used. Hey girl...love this card. Great colors and the coffee cup looks delicious. very darling. i lovee the background paper and blue + pink accents. How clever! I love the stitching around the border, and your pen work added that extra cute touch. Really pretty! very cute! i love stuff with coffee cups. and ribbon. I love the way you framed your Elegant Edge mat with ribbon! That's looks so pretty! The contrast of the hot pink and Caribbean is super too! Very beautiful card! I love the look of it!